Works on any phone: Samsung, Motorola, Google Nexus, iOS etc. Watch live racing video from around the world on your phone & tablet. Betting advice section with tips from racing publications & papers. One of the best designed and easiest to navigate bookmaker apps. Paddy Power have managed to transform from a local, Irish bookmaker into one of the biggest in the world. Their history dates back to 1988 where they opened up a number of high street stores throughout Ireland, before then venturing into the world of online betting. It's been pretty clear that their online venture has been the one that's really given the bookmaker a global status. As a company who hold very true to their Irish roots, they are probably that little bit more light-hearted than most bookmakers and if you haven't had chance to check out their hilarious Twitter account, then we would highly recommend doing so. That being said, you can't get to the top of an industry like gambling by being a bit of a joker; you need some substance to reach the heights that Paddy Power has managed to do so. Their latest venture into the world of mobile betting has seen them add yet another string to their bow with this being one of their more successful implementations over the years. As they are Irish, horse racing is going to be a sport that is covered heavily from a bookmaker like PaddyPower. The sport is simply huge in their native country but as they target more countries and markets from around the world, it's often horse racing that a lot of punters turn to the bookmaker for, without disappointment. This review will be looking at how well the sport performs from their betting app. As we've mentioned, horse racing is going to be a huge sport for Paddy Power, and what's probably most interesting to see is that it gets as big a following - if not more- than that of football. In fact, it's even listed before football on the app just showing how important it is to the company. 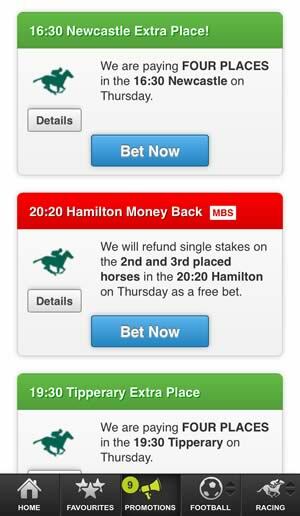 You can dive straight into the horse racing section by clicking the little icon at the top of the app. Alternatively the homepage will likely have a number of quick links where you can access certain upcoming races from around the world. 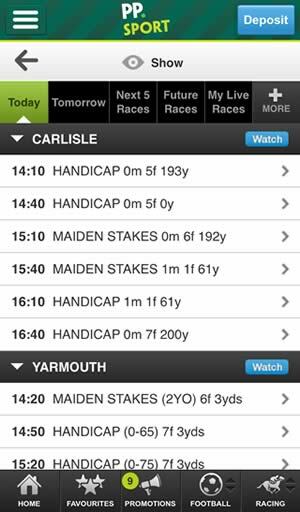 The next featured race can be found as the first installment of markets on the app which will include an overview of the horses running and their current odds. 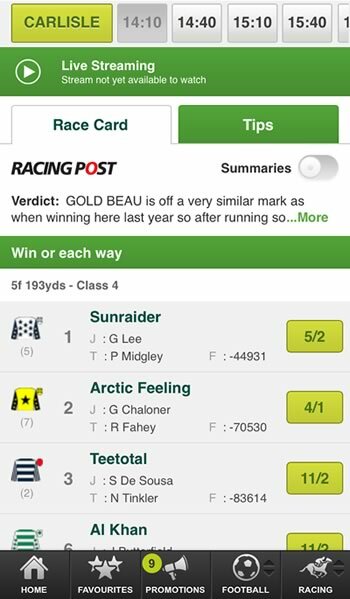 You can scroll down to see links to the next three races that Paddy Power have covered from the app. Finally, a button in the bottom right hand corner can be clicked from anywhere on the app allowing you to select live horse racing, next 5 races and the horse racing home. The horse racing section proper initially gives you a long list of the races that are taking place around the world for that day. They will give you information that includes where the meeting is taking place, type of race and distance, before highlighting if any of those markets have any offers or promotions attached to them. Also included will be a little blue 'Watch' button to signify if there is live streaming available, which we will talk about more later in the review. The top of the home section also allows you to flick between tomorrows racing, next 5 races, future races, live races and a more button. The more button shows racing from America, special bets, daily specials and even virtual horse racing, if that's your thing! 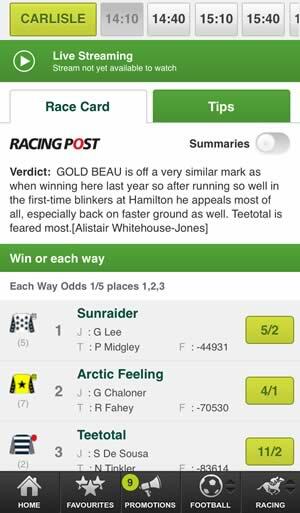 The race card is arguably what the whole racing section is all about and we were delighted with what Paddy Power have on offer. A typical card will include information on the horse such as jockey, trainer, form, odds, number and silks. On top of that though you can click the summaries button in the top right of the race card to see a little overview of how that horse has been performing in recent times and how they might fair in this race. The information is taken directly from the Racing Post which is one of the most reputable racing magazines in the world. It's probably not as in-depth as you would get from their site, but if you think that’s an additional feature from essentially a betting app, it's more than sufficient. 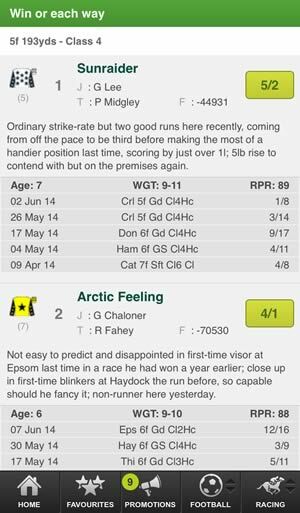 You can also click a small 'more' button to find a synopsis for the upcoming race, again taken from the Racing Post. This is a broader section of information and more to do with the overall outcome of the race. Below that you will be able to see if there are any promotions relevant to that race. 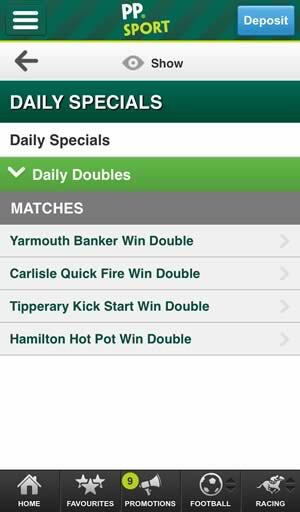 Paddy Power often run money back specials on a number of races throughout each day and it's easy to spot if there are as it's highlighted in red. By clicking the button it will allow you to see which markets they are refunding and a link to the terms and conditions should you want to find out more on this. The race card also includes a tips section, which is an interesting inclusion with not many bookmakers directly offering this. It looks like it once again comes from the team at the Racing Post where three tipsters will choose between the field and show you who they have selected. If you are familiar with the Racing Post, they are pretty consistent with who they allow to produce tips, so it's easy to see who have chosen which, if you like taking information from the same tipster. Live streaming is also available directly from the app, which is a really nice addition. The numbers of races vary, but you can generally find the majority of UK and Ireland races, with a few from around the world thrown in as well. You need to have placed a bet on the race to be able to stream it from your mobile. The app is definitely one of the better looking ones on the market at the minute. Like many bookmaker's, PaddyPower have continued to change and improve certain aspects of their app, none more so than their design. It's pretty simple in all honesty, but that’s definitely a positive when it comes to mobile betting. If you are familiar with Paddy Power then you will be right at home with their green and white colour scheme that runs true pretty much throughout the app. It runs smoothly even off limited connection speeds and we actually liked the fact you could link between their casino and even bingo sections should you require. Paddy Power have always had a strong affiliation with horse racing and after years of using their online bookmaker, we know exactly how much of a role the sport plays to them. It's for this reason as to why we came into this review with such high hopes and were looking for them to be one of the leading mobile betting apps for horse racing in the industry. We were not disappointed! The app looks and runs as smoothly as you will find, but the features from within the app were also really impressive. The inclusion of live streaming is an added bonus but we thought that the features in and around the race card were about as good as we have seen. 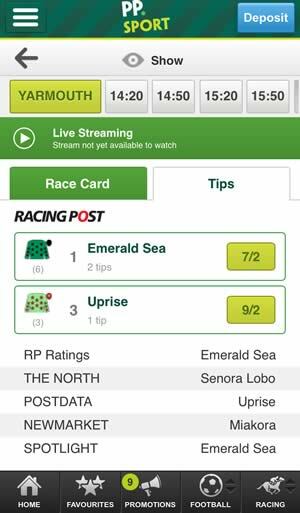 The inclusion of information from the Racing Post and also a little tipster section really added depth to one of the best overall racing apps we have come across.